It was a gamble that paid off. 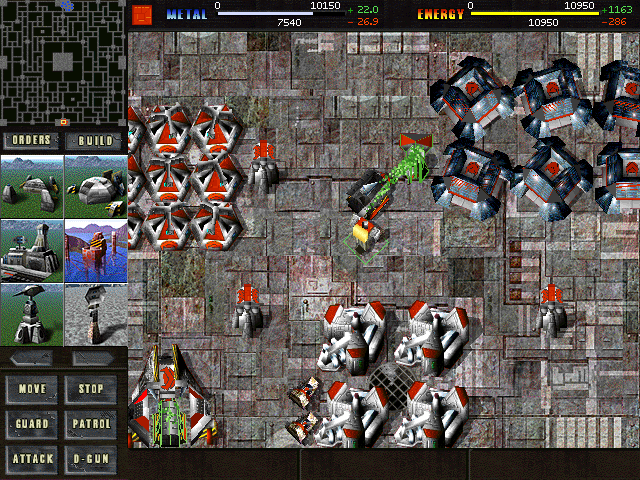 Reviewers and gamers praised the Total Annihilation soundtrack and it’s easy to see why Soule’s work met with such enthusiasm. Total Annihilation doesn’t waste a second and dives head first into the action. From the moment “Brutal Battle” kicks off with a propulsive brass motif that sounds like the starting gun to a fierce space battle, it’s obvious that Soule’s idea to write a Star Wars-style score was an inspired choice, realised with immense amounts of panache and verve. Indeed, the Total Annihilation soundtrack plays like music underscoring hundreds of spaceships whizzing furiously past each other. What it doesn’t really sound like is two lumbering armies clashing in battle. 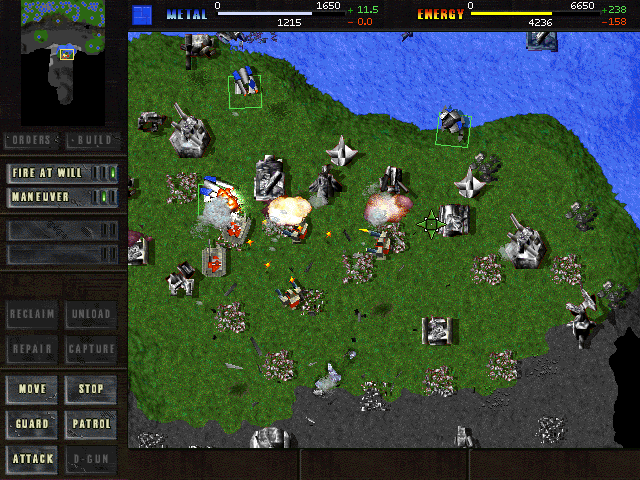 But that Total Annihilation is more dramatic than almost any other RTS score is also its greatest asset. After all, it’s hard to imagine music that could get gamers fired up more effectively for combat. Total Annihilation is clearly the work of a young composer seizing with unbridled enthusiasm the opportunity to write for live orchestra (it’s worth pointing out that this soundtrack could hardly be more different in tone to Soule’s previous major work Secret of Evermore). The score’s first half is a constant hotbed of orchestral activity. It’s led by wonderfully frenetic brass material that balances the music’s potentially oppressive martial character with moments of soaring heroism. The sheer amount of orchestral activity can be quite dazzling in its restless motion. Breathlessly cascading strings and an endless supply of cymbal crashes lend frenzied rhythmic support to the brass melodies and fanfares. It’s an exhausting listen, but in the best possible way. After each track, you’ll first need to catch your breath and reflect on the whirlwind that has just passed. 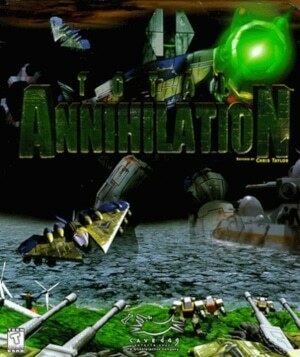 The fact that Total Annihilation‘s action tracks are on the short side does nothing to diminish their appeal. There is so much happening within these two-minute compositions that few listeners will find reason to complain. None of this is to suggest that Soule’s approach here lacks finesse or subtlety. Just when the brass motif that opens “Brutal Battle” threatens to turn monotonous, Soule changes the piece’s direction seamlessly by throwing in one of the most triumphant melodies of his career, before making a piano the main protagonist during the track’s middle section. Throughout the Total Annihilation soundtrack, xylophone or piano double the brass lines, adding colour – not weight – to keep textures agile. “Ambush in the Passage” begins at a more dignified, calm pace before revving up the tempo, while “The March Unto Death” exemplifies Soule’s classical inspirations most clearly and in striking fashion. The track begins with a string melody and rhythmic support figure reminiscent of a symphonic, early Beethoven-era Allegro. Soule manages to perfectly combine this unexpected stylistic choice with the late-romantic orchestral furor surrounding this segment. However, it is impossible to fully discuss the Total Annihilation soundtrack without mentioning its second half. It’s here where listeners find the music written for moments of (looming) defeat. Soule translates these occasions into dreary dirges, featuring little in terms of melodies, instead relying on pained, uninspired textural work. It’s a jarring transition, leaving no emotional middle ground between undisputed victory and utter defeat and desolation. The terribly artificial, hollow sound of the high-pitched, sustained string chords ruling most of these compositions doesn’t help. Just sample the strings on “Licking Wounds”, which sound like a faint imitation of the real thing. 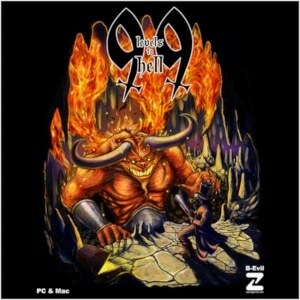 As a whole then, the Total Annihilation soundtrack is a frustrating experience. However, its first half is a thrill ride, full of unfailingly rousing, enthusiastic music of outstanding quality that ultimately makes the score impossible to ignore. Just look past the album’s downcast mumblings and enjoy 16 minutes of some of the most rambunctious action music ever written for a video game. Purchase at Good Old Games.